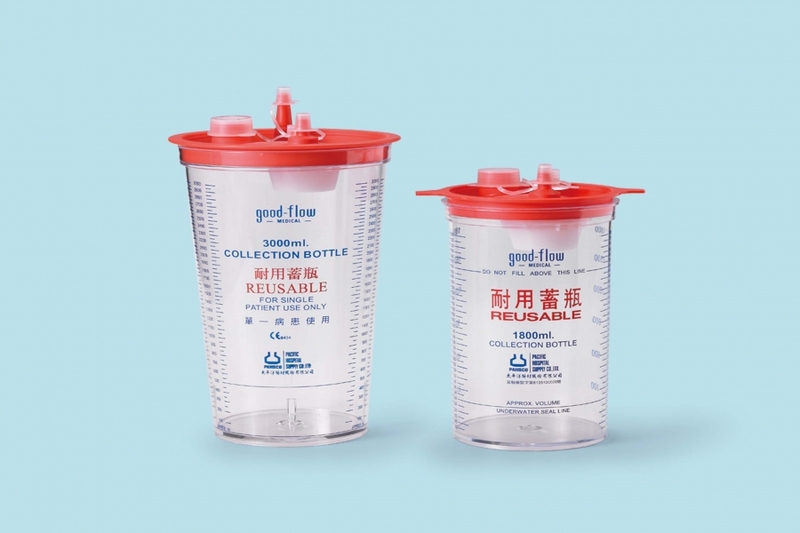 Reusable Collection Bottleis designed to collect any secretion evacuated while surgery. It is manufactured in polycarbonate for convenient handling by the end user. Unlike the glass material, the polycarbonate collection bottles are virtually unbreakable, combining the convenience of glass with the safety of polycarbonate which can be steam, gas sterilized or autoclaved. It is more convenient and more economical than glass. Suitable for OR/ ER/ ICU/ general ward. Reusable after sterilization for cost saving. Extensive use of polycarbaonte, so the cap and bottle can be gas and stem sterilized up to 121°C for 30mins. Secure-fitting cap for bottle helps prevent leakage. Cap and float assembly includes a patient port inlet that is horizontal to help prevent kinking of suction tubing. Covers fitted with inlet adapters marked PATIENT/VACUUM for easy-use. Stepped adapts allows direct to all standard connecting tubing. Positive shutoff valve closes immediately and efficiently when fluid is full. Non-return valve effectively prevents reflux retrograde infection. Effectively filters aerosolized microorganisms and particulate matter. Clear bottle allows visual inspection of fluid levels, color and consistency. Graduated scale printed on the outside of the canister allows the volume of the collected liquid to be monitored. 1500 c.c. and 3000 c.c. capacity.